It is too long and I step on it. Night time they have a tendency both end up through one nostril. It wakes me. 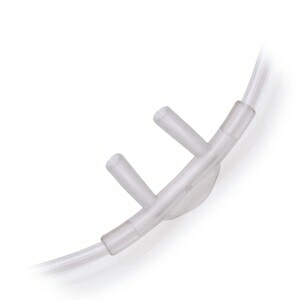 I found out about these nasal cannula's from being the ER of my local hospital. I had been wearing the usual thicker tube like cannula's and once I put these on I had to find out where I could purchase them for myself. They are so much more comfortable than the ones I was given through my oxygen company. I went online and found the I could order them through Direct Home Medical.com and they are not expensive and well worth the difference in comfort from the usual thick coated cannula's. These don't leave those ugly lines on your face when sleeping as well as you hardly feel like you are wearing oxygen all day. I have recommended these to friends on oxygen that have experienced the same problems I did. They have all thanked me many times for telling me about Direct Home Medical.com and the great service and products they provide. i carry an oxygen tank when i'm away from home. i'm short in stature. the 7 foot cannulas were hard to deal with because they were too long. the 4 foot ones are perfect!! I have bought this cannula before and it works out well. I only needed the 25 foot tubing this time and that works out well too. Product was received and functioned as expected. Good product. Great price. Was expecting a larger diameter tube, but seems to be working as it should. The best equipment I have ever ordered and I WILL order this again - soon. The tubing on this cannula was stiffer than the ones I've been used to. My sweet daughter got it for me since it was a 4 ft length that I wasn't able to get from my oxy supplier. Unfortunately, it just kept coming off my face. I sure like the length though as I'm 5'3" and the connector doesn't drag on the floor and get caught on doors and furniture legs. 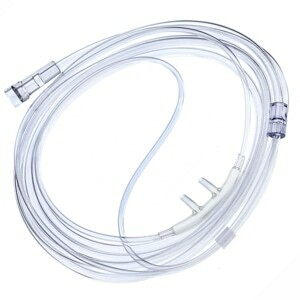 I wish you had provided the size in cm of diameter of tubing connected to cannula. With glassed, hearing aids and cannula tubing behind my ears it get crowded and painful. My husband really likes these only they do tend to tangle. He says they are more comfortable than others he's had. Excellent cannula. 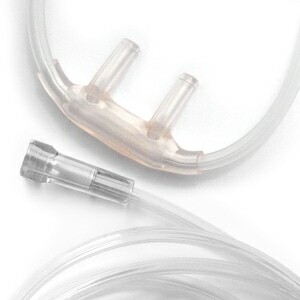 Soft silicone rubber nosepiece and upper tubing that is very comfortable in use. Since I am on oxygen 24/7 it was important for me to find a comfortable cannula. My only issue is that I need a flow of 4 to 8 so I can't use these all the time. Hoping you might come up with a similar design for high flow. The only soft part is the nasal prongs. That is not enough. They are hat on the ears. Affordable tubing delivered in a timely fashion and so much nicer than I expected. Great purchase!! The tubes are just the right length for sleeping and using with the portable tanks. this is the same as every other nasal cannula except the 7' super soft. I am completely happy with the softest cannulas that I have ever used. Because the cannula is only 4 ft I no longer have a problem with the connector to the 50 ft hose catching on things. It is short enough that the connector doesn't drog on thr floor. Other cannulas are too soft for sleeping. These are just right. The softer ones are fine if you use while awake, but they aren't great for sleeping. It is very hard and not flexible at all am having a hard time wearing it. I don't care for the Softech Cannulae that I purchased from you. I was under the impression that the whole cannula that goes around your face was soft and pliable and it is not. It is different on the nose piece than others but the rest is no different than any other cannula. I have tried lots of different cannulas trying to find one that doesn't irritate my nose. The curve always seem to annoy me while sleeping. These are great and cost less than a lot of the others I have tried. They are very comfortable. I used the chat to find them. Thank you. Perfect fit for my Activox Oxygen Concentrator. Less tubing flopping around with the usual 7' tubing supplied with the unit. Very satisfied. On oxygen 24/7, I find that a standard 7' cannula is too long when I am using my portable compressor. My oxygen company does not carry 4', so I was thrilled to find them here. The order arrived quickly, and the item was perfect. The cannulas had the longer nose pieces I hoped for. A great improvement over the rigid cannula so supplied by the VA !! I found this nasal cannula had a very strong odor of the type that some plastics have when they are off-gassing. The odor did not go away with time, I finally gave up on it after using it for a week, as the smell would not dissipate. It is comfortable, so it was a shame that the smell made it unusable. I ordered cannulas and I received them promptly in good condition. This cannula was exactly what I was looking for and it works great. It is a bit softer than the ones I usually use. I am very satisfied with the product. The nasal portion was the soft silicone however the rest of the tubing that goes around the ears was still the hard plastic. I was looking for the entire setup as soft tubing. Like the size to add to the 35 foot tubing I also use. I don't step on the connection piece and I have less trouble with it getting stuck on things in the house as I travel around from room to room. Cannula had an offensive odor when first used. I pumped air through it and that eliminated the odor. I have used only 1 of them so far and am satisfied with it. Great product! Solved my problem with ear pain from regular cannulas. I have used numerous brands of nasal cannula, but I must say this one is the best. It is soft and the prongs are not too long. I have to sleep every night with O2, so it is imperative to have a comfortable cannula and this one is it! The 4-foot length does not create a problem when walking around with a portable oxygen container. Th 7-foot lengths leave too much hose hanging free and it is hard to curl it up to hold out of the way. These are very good. They are perfect as to quality and comfort. I would recommend them to anyone. Also, the package was delivered quickly. I like the soft piece that goes into my nose but the rest if the cannula on my face also needs to be soft so it does not leave a dent in my skin while I am sleeping. Other than that the product is good. I have a small portable oxygen concentrator. I find that the softech cannulas are the most comfortable, soft and provide a good fit for me. When I shop, I put the POC in my cart and the 4' length cannula is perfect in this case so I don't have extra tubing to keep moving around. These are so stiff and hard on the ears...they spring off at the slightest movement. The only soft part is the nosepiece...its good. But the overall construction and material does't work. Great company to buy from, bad manufacture. I have a portable oxygen concentrator and received 7' cannulas from my pulmomologist at the University of Utah Medical Center but being only 5'2" would trip over it. Not good! I like this brand because the nasal tubes fit my small frame better than any other brand, some are too wide for my nose and some too long for my nostrils. I was given pediatric cannulas, they fit my nose but the nasal tubes were too short. 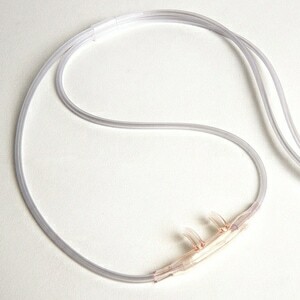 I searched every medical supply business in the Salt Lake City, UT metropolitan area and could not find the 4' cannula. I found these online, ordered them, and received them very quickly. Now I don't trip and breathe better without getting sores inside my nostrils because of the better fit. Now if I could only find 25' and 50' cannulas by this manufacturer my breathing will be guatanteed. Delivery was faster than expected & product was as ordered. The price was, by far, the lowest of all competitors! Will re-order. Liked the shorter length of tubing. Very comfortable to wear. Cannula tubing 4 ft works same as 7 FT but is 3 Feet shorter so does not become a problem with too much tubing hanging all over the place. If you do not need long tubing then I would say buy this one. The oxygen cannulas arrived speedily and my husband finds them extremely comfortable. Thanks! Cannula is great, but for my purposes, the supply hose needs to be about 7 ft long. Hard to find 4 ft tubing. I was pleased with quality and price and fast service. I was paying $25 for a cannula that the prongs got very hard and brittle every 2 months. I decided to go online and price them. The price was 5 times+ less than I was paying and the cannula is much more soft and comfortable. It came in record time, order complete. Very Pleased! I tried the 4' cannula primarily because the 7' cannula kept getting caught under doors or was dangerous to step on. The 4' cannula has achieved that purpose well. It is a little smaller, but I am on reduced o2 at home on a concentrator and long tubing, so it not a problem. Very handy and comfortable for portable units. like the softech with 4 ft 02 supply tubing. It fits the face without pulling tight every time you move.Also less tubing to wrap around my ankles when walking. This item was purchased for my dad who has a portable concentrator (battery operated) which he takes with him outside and in the car. He does not want a lot of extra length to the tubing and the 4 foot is just enough. The composition is also very soft, making it easier to deal with behind the ears. Thanks you so much. would have preferred a more flexible (latex) cannula. The cannulas are okay but do smell of latex when first used. The hose is a little too stiff, I would like them if they were a little more flexible.